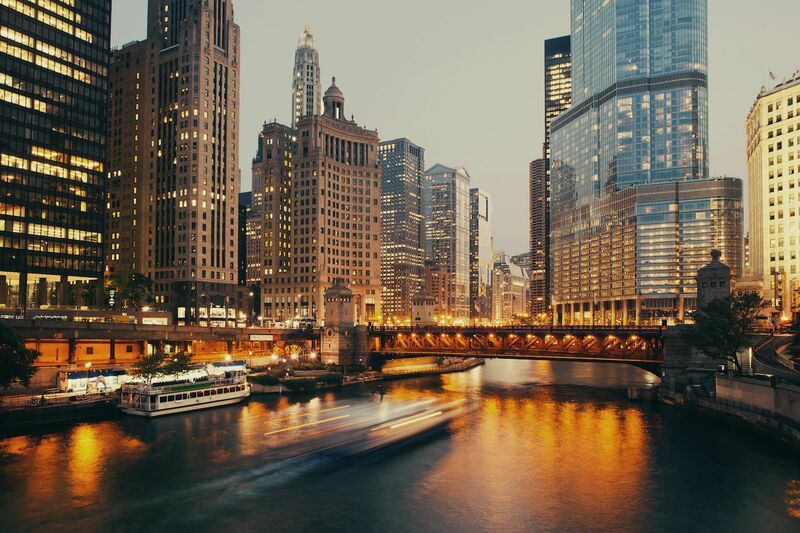 Bridges seem to captivate people more than any other structures, not only as engineering marvels that connect previously separated areas but also as local icons that become unmistakable parts of a city. They’re places to relax, places to hone your photography skills, and sometimes places to beat your head against the steering wheel when stuck in traffic. But they always bring a sense of wonder and a little bit of closeness to the water. So it’s no wonder that bridges are among the most photographed places on Instagram. 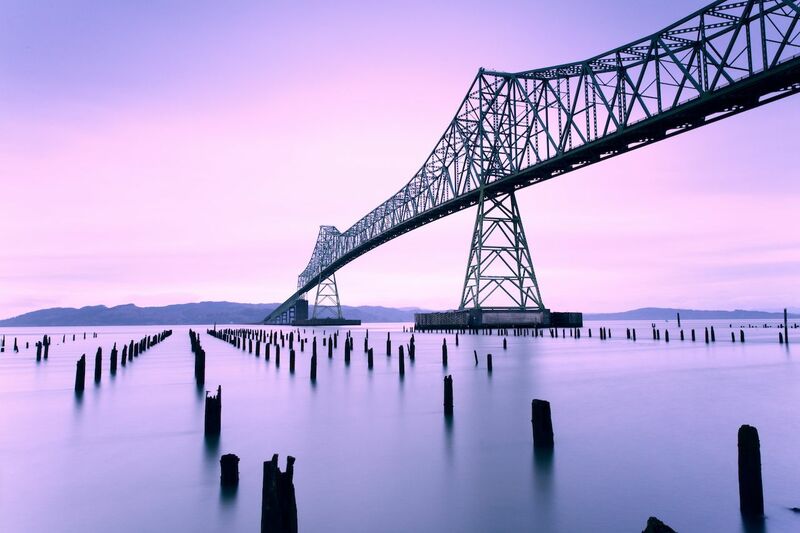 The folks at Orbitz took a look at which bridges drew the most Instattention, citing the most scenic according to mobile photographers in each state. 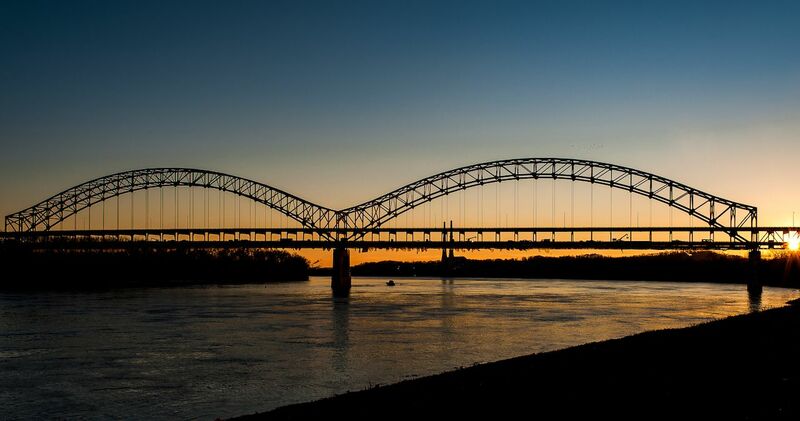 This bridge is known widely for its historic significance during the Civil Rights movement, site of the famous “Bloody Sunday” clash between peaceful protestors and armed police. 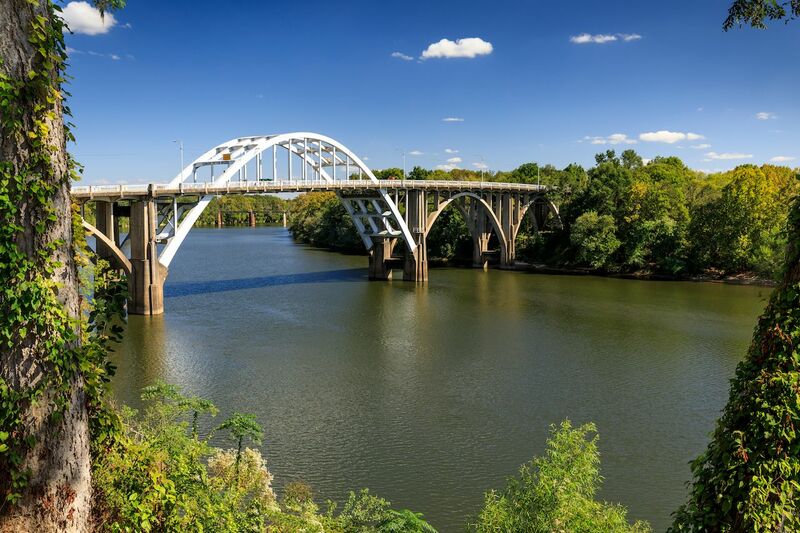 Interestingly, the bridge is named for a former Confederate general and Grand Dragon of the Klu Klux Klan, and though its part in history is a particularly notorious one, this span of steel over the Alabama River stands as a symbol of the state’s past. By virtue of its remote location and unforgiving terrain, Alaska has created numerous feats of engineering. 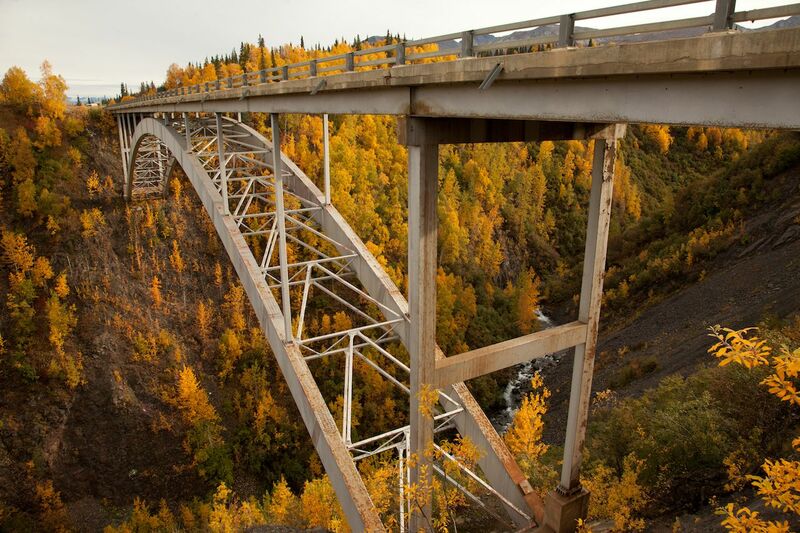 But few are as wondrous as this 295-foot-tall bridge along the Alaska Railroad crossing Hurricane Creek. Nearly 300 miles from the nearest city, the bridge was the most expensive part of the entire railroad system, requiring an aerial tram and quick work over long days in the summer of 1921 to complete. It was the tallest bridge in America before Alaska was even a state, and today, it makes for one of the best photo ops along the Denali Star and other popular train rides. The majestic red rock canyons of Arizona have disappointingly few bridges crossing over them, leaving this bridge near the Glen Canyon Dam as the most scenic in the state. The two-lane bridge was originally built to carry supplies across the Colorado River along US-89 to help build the dam, which sits less than 900 feet away. It was the tallest arched bridge in the world when it opened in 1959 and is still one of Arizona’s most-photographed sites. Kudos to Arkansas for our favorite bridge name in America. Purportedly, it’s named for the Murray Lock and Dam it stands over, but it sounds much better as a superlative. It’s the longest bicycle and pedestrian bridge in America at 4,226 feet and one of the great urban recreational paths in a US city. 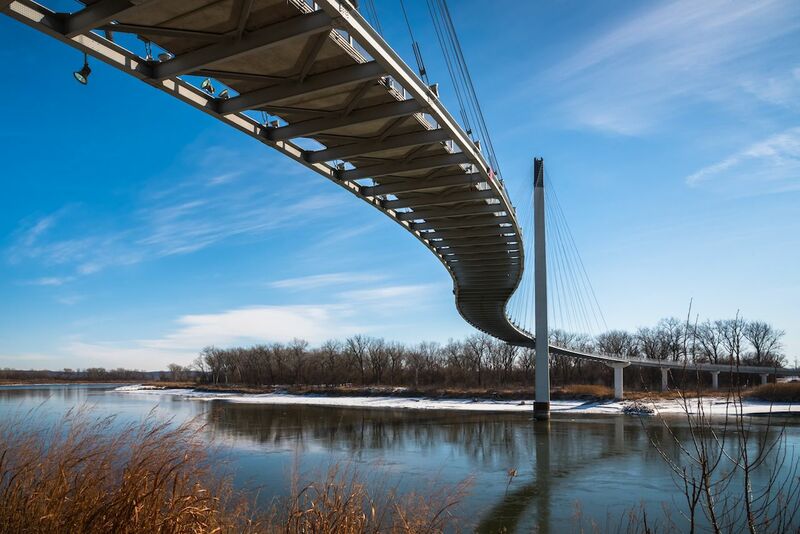 Beyond crossing the Arkansas River, it connects over 14 miles of riverside trails and gives pedestrians and cyclists access to the Clinton Presidential Center and other local attractions. We’re all familiar with the Golden Gate, right? Ok, so instead of telling you about the beauty of a fog-covered city peeking out from behind this bright orange marvel, here are some fun facts about the bridge: Each of the 746-foot-tall towers contain 600,000 rivets. It weighs 887,000 tons. The two steel cables contain about 80,000 miles of wires. Its official color is called GGB International Orange, but it was almost painted black and yellow. But contrary to urban legend, it’s not constantly being painted, rather touched-up as is needed. Now go impress your friends at trivia night. 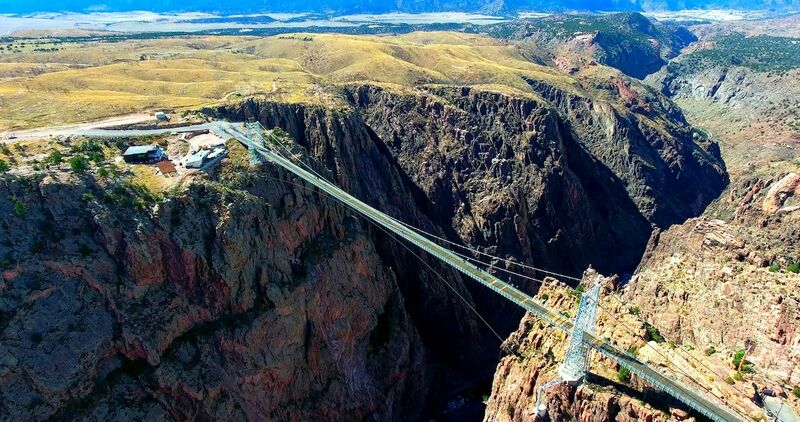 Most people don’t know the Royal Gorge is the highest bridge in America at 955 feet above the Arkansas River. It was actually the highest bridge in the world until 2001 and the highest suspension bridge until 2003. Today it’s still pretty impressive, boasting a zip-line, aerial tram, and a skycoaster, all with spectacular views of the red rock gorge and the mountains beyond. 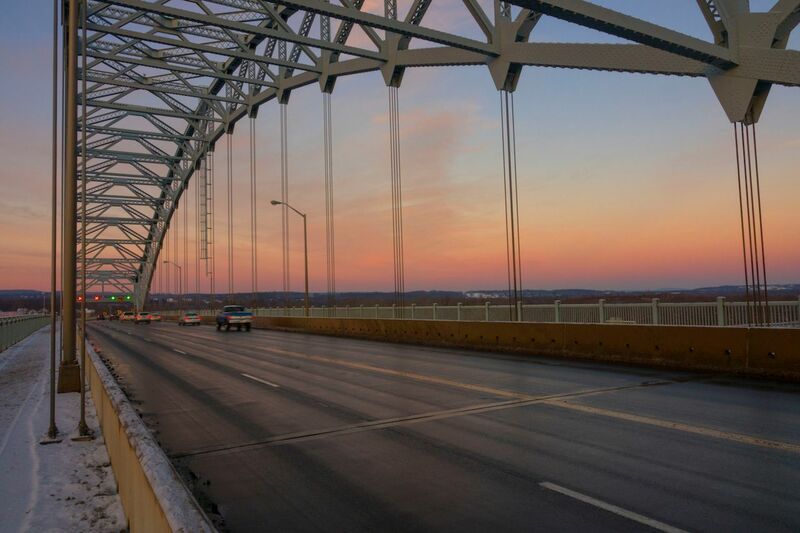 Connecticut’s vast network of steel truss bridges boast some of the state’s scenic highlights, but none is quite as striking as this one linking Middletown and Portland across the Connecticut River. 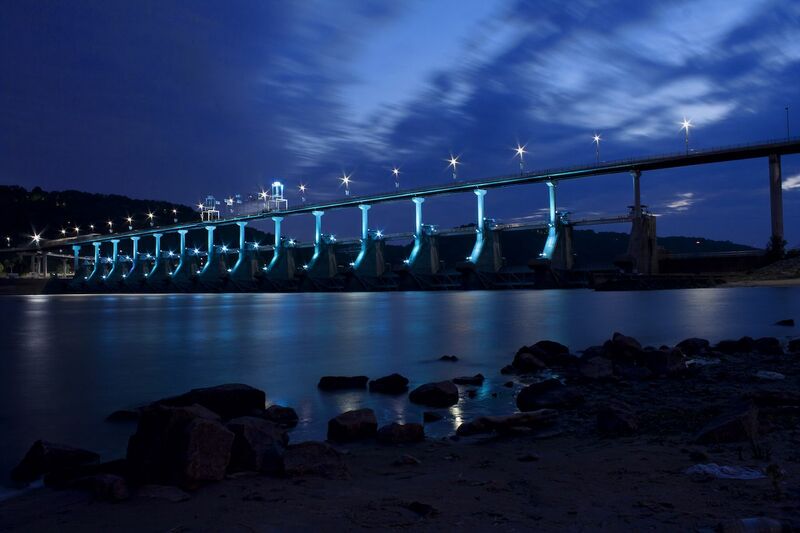 At 3,428 feet it’s the longest bridge in the state, with two 600-foot arches creating a pleasant industrial symmetry set against changing colors in the fall. It took two years to complete between 1936 and 1938 and is the most expensive bridge in Connecticut at $3.5 million. The money and labor were well recognized, though, earning the Arrigoni first prize in the American Institute of Steel Construction’s large bridge category in 1938. For New Jerseyans traveling to points west — who don’t want to deal with driving through Philadelphia — nothing says “Welcome Home!” like these green towers crossing the Delaware River. It’s the only fixed crossing for cars between Delaware and New Jersey and the southernmost crossing along the river. Today it carries about 80,000 cars a day and a $4 toll, connecting New Castle with Pennsville, New Jersey. When lit up at night, the four-lane suspension bridge serves as a scenic sentinel over the mouth of Delaware Bay and one of the state’s prettier sites outside the beach. Driving from Miami to Key West along the Overseas Highway is one of the most scenic drives in America, even more scenic now that much of the roadside vegetation was swept away by Hurricane Irma. 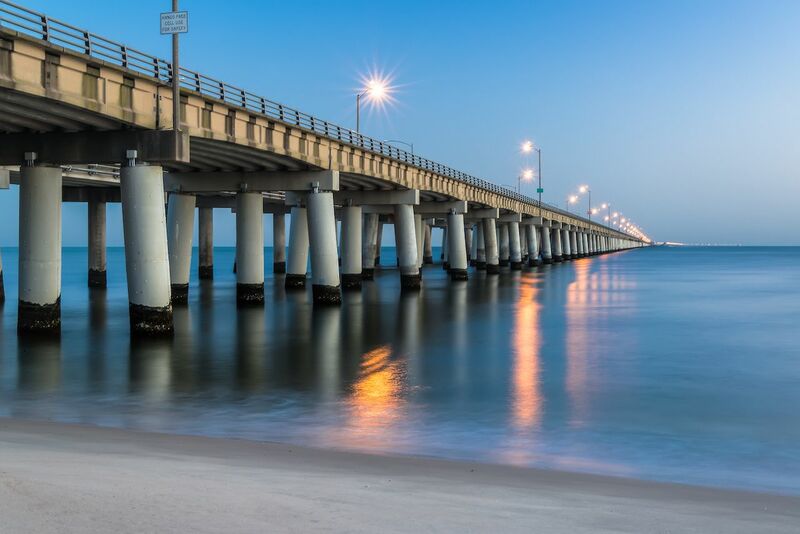 The seven-mile stretch between Marathon and Big Pine Key gives the sensation of driving atop open ocean, and when the original bridge was constructed in 1912, it was dubbed the Eighth Wonder of the World for its length and ambition. The new version is far more hurricane-resistant, and each April is home to a running race that draws hundreds from around the world. 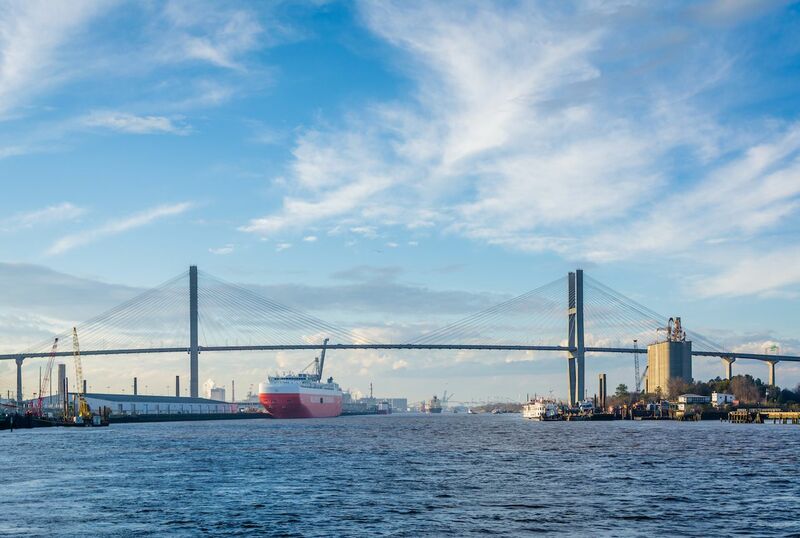 With all its southern charm and Spanish moss finery, people often forget Savannah is home to the fourth-busiest seaport in America and the largest single ocean container terminal on the East Coast. Standing atop that seaport is the Talmadge Memorial Bridge, a cable-stayed structure stretching from downtown Savannah to Hutchinson Island, 184 feet above the river. Its height allows for large ships to pull into port unimpeded, increasing commercial maritime traffic to the city. Though its backdrop is cold and industrial compared to the rest of Savannah’s warm hospitality, the scale of ships crossing under the bridge is one of the prettiest waterfront images in Georgia. The smallest and most understated bridge on this list is this double arched path across Anahulu stream on Oahu. It’s a scant 161-feet long and sits on a very typically Hawaiian scene of palm trees and blue waters, with arches meant to invoke the rainbows symbolic of the state. 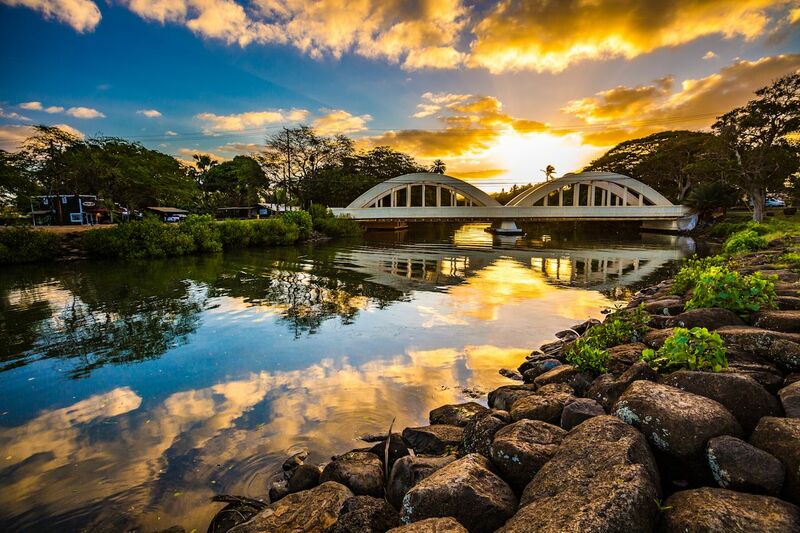 Despite its idyllic setting, the bridge is the odd spot on Oahu that’s not typically jammed with tourists, and it’s definitely worth a stroll if you make it to this quiet part of the island. 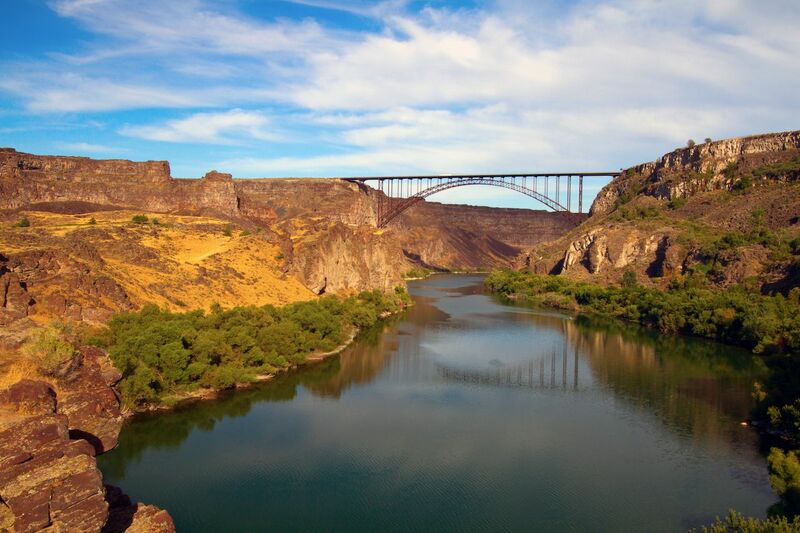 The Snake River canyon has drawn adventurers for decades, most notably when Evel Knievel unsuccessfully tried to jump the canyon aboard his skycycle in 1974. 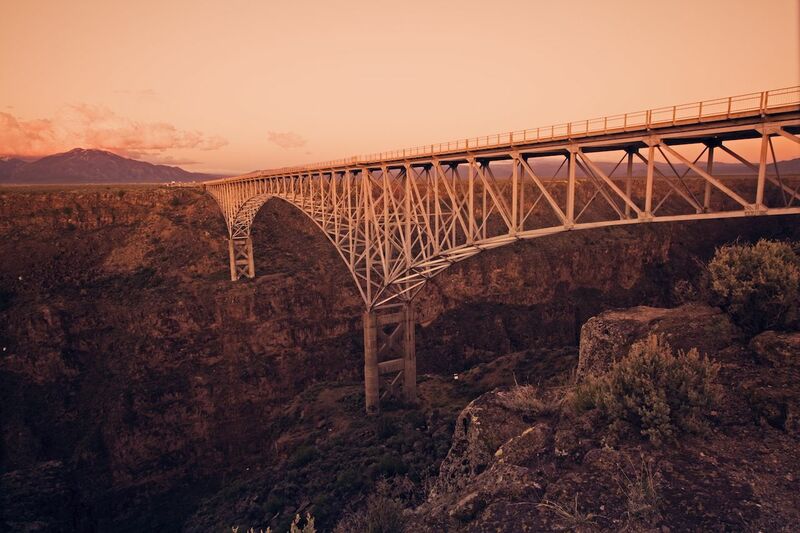 You can still see part of his ramp when visiting the Perrine Bridge, a 486-foot arched bridge that’s unsurprisingly popular with base jumpers. 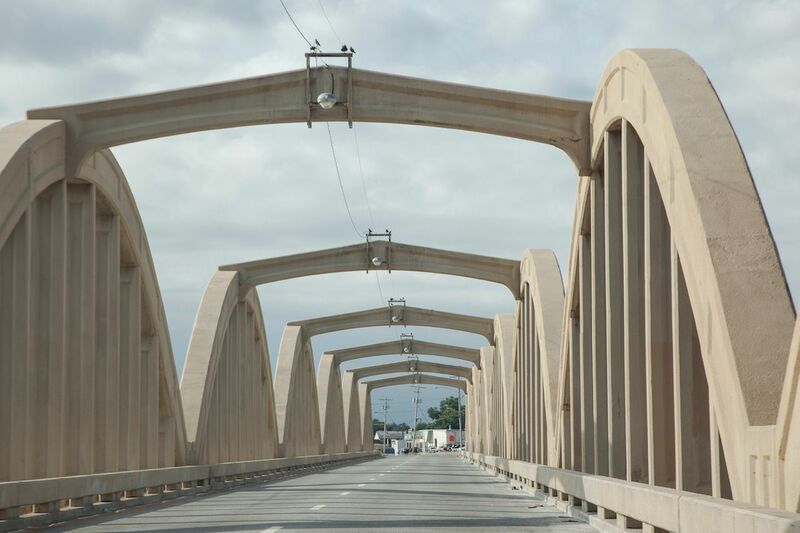 It was the highest bridge in the world at the time of its construction in 1927, though the current version was constructed in 1976 to allow for heavier traffic loads. The original was built for $750,000; the 1976 price tag was $10.56 million. At first glance, this simple red span across the Chicago River seems like an afterthought to the canyons of urban architecture around it. But like most older buildings in Chicago, the bridge is intricately detailed, designed to resemble the Alexander III bridge across the Seine in Paris. Each of the four bridge houses features a sculpture depicting the four great events in Chicago history, giving a bit of education to anyone who wants to cross a couple of times. If you can catch the bridge while its up, you’re in for an unusual photo op. Though it was once opened multiple times daily, traffic now dictates it only opens seasonally. 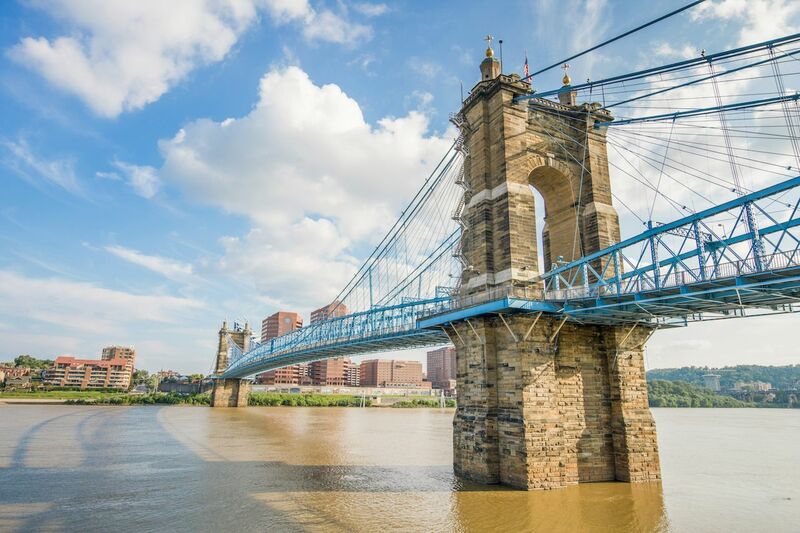 Though this double-arched bridge is generally associated with Louisville, Kentucky, few outside the Kentuckiana region realize it connects that city with Indiana across the Ohio River. This section of I-64 has two decks, the eastbound traffic from New Albany into Louisville on the bottom deck and the westbound traffic up top. It’s a major commuting route for those living in suburban Indiana, and its planned closure in 2021 for much-needed repairs is already a dread for much of the city. The Quad Cities in Iowa and Illinois are crucially connected by this green, double-suspension bridge across the Mississippi River. The bridge has served as an icon for the region since it was built in 1935, then officially dubbed the Iowa-Illinois Memorial Bridge. 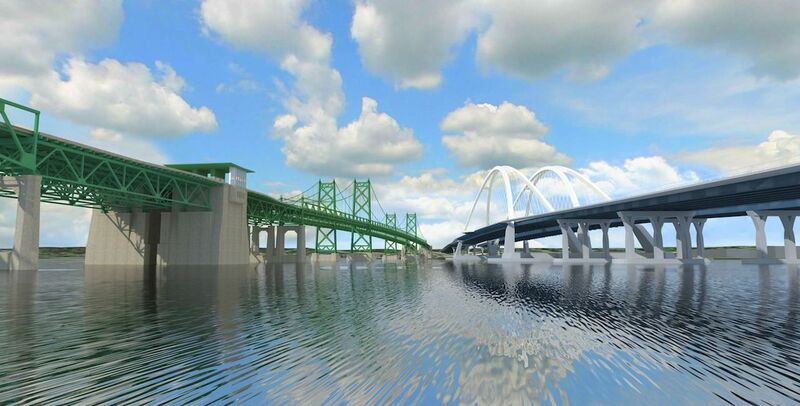 Though the classic towers are a familiar sight for those who traverse the Midwest, in 2021 a sleeker, white, two-arch twin bridge just upstream will replace them. The current bridge will be subsequently imploded in what’s sure to be a viral video sensation. Kansas architecture isn’t really a concept many outside the state are familiar with, aside from a handful of jokes about farmhouses. But the James Barney March Rainbow Bridges were a fixture across the state for much of the 20th century, a concrete, single-span style unique to the Sunflower State. Fewer than a dozen of the Marsh bridges remain today, the most notable being this one, the odd multi-span bridge across the Arkansas River. Thanks to historic preservationists, the bridge was saved from demolition in 1991 and placed on the National Register of Historic Places in 1992. 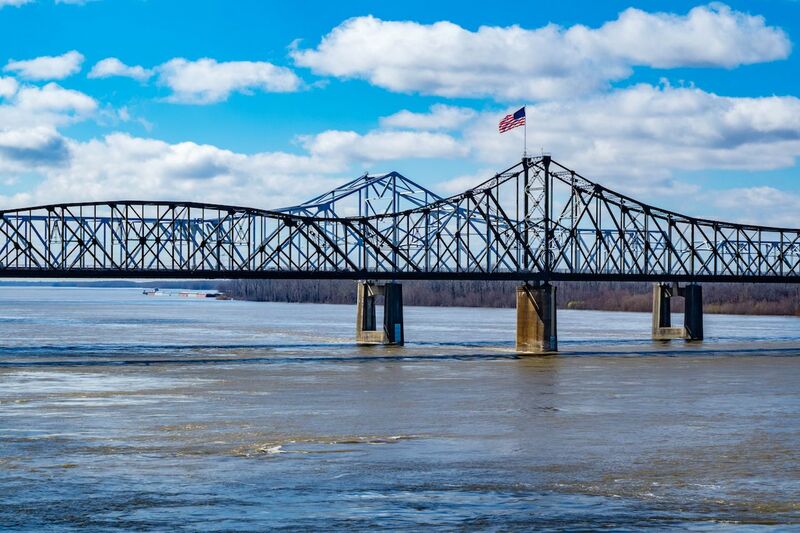 Louisville holds the distinction of being the only city on this list to boast two states’ prettiest bridges: Indiana’s Sherman Minton bridge and this one. The Big Four is a former railroad bridge that’s now the cornerstone of Louisville’s waterfront park. It was decommissioned in the 1960s then reopened in 2013 as a pedestrian bridge that now hosts over 1.5 million visits per year. 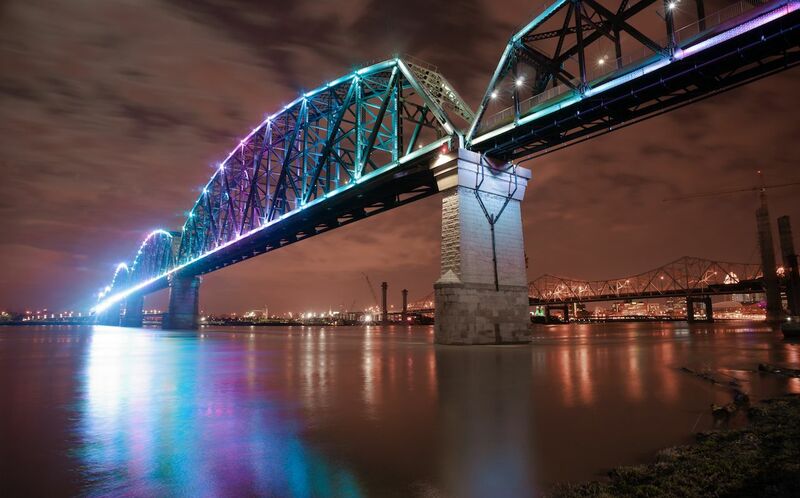 Its LED lights have become an iconic scene of the Louisville skyline, giving the city jolts of bright purple reflecting off the Ohio River below. 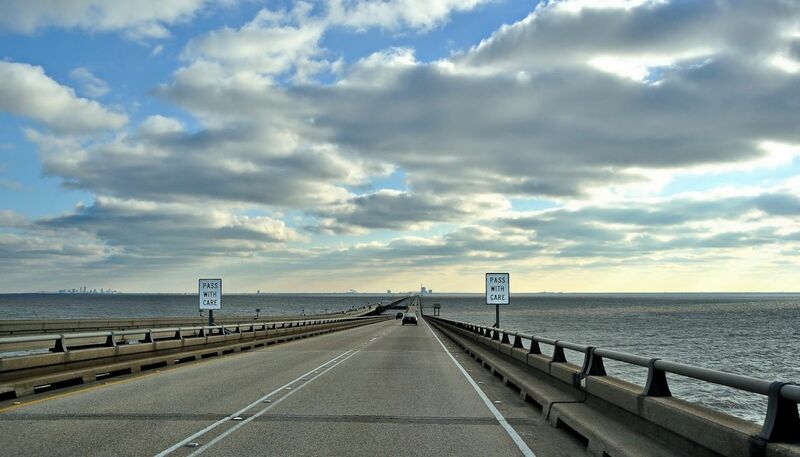 The self-proclaimed “World’s Longest Bridge Over Water” is a 24-mile span that connects New Orleans with Mandeville across sprawling Lake Pontchartrain. Though the Guinness Book of World Records cites the Jiaozhou Bay Bridge in Qingdao, China, as the world’s longest, it only crosses about 16 miles of water. The Causeway crosses nearly the full 24. Debate away, but this marvel of engineering in the Bayou is still one of America’s great feats of construction. And though the half-hour ride across can be harrowing on windy days, it’s still the most scenic drive in the state. 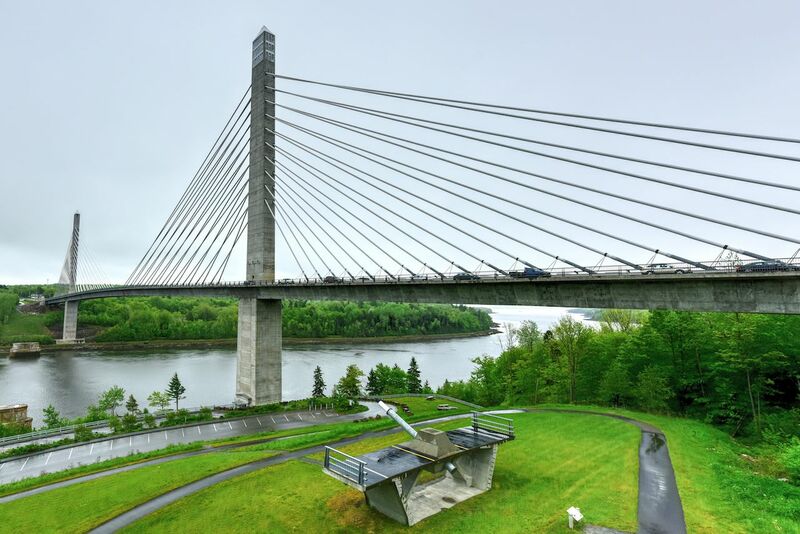 This stretch of US-1 across the Penobscot River in coastal Maine is much more than just a bridge, boasting the tallest bridge observatory in the world with stunning views out over the New England countryside. If you’re not so into heights, the bridge also sits next to historic Ft. Knox, which while not the one with the gold is still a fascinating look at Maine’s role in US history and our border disputes with Canada. 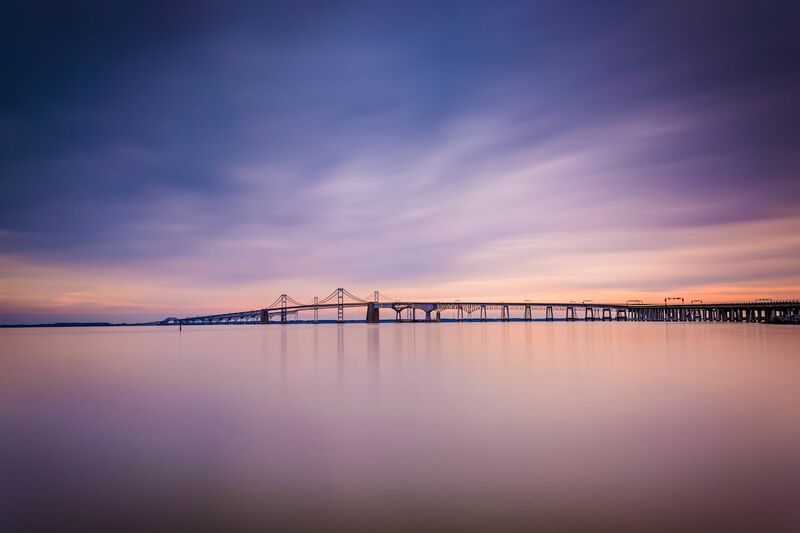 At the time it was built, the 4.3-mile Chesapeake Bay Bridge was the longest continuous over-water steel structure in the world. Though it’s long since been surpassed, it’s still one of America’s most famous roads, connecting the beaches and vacation destinations along Maryland’s eastern shore to the population centers of the Mid-Atlantic. This is why during busy summer weekends you’ll sometimes have hours to marvel at its beauty, as traffic backs up on both spans for hours. Like another familiar Boston icon, the Tobin bridge is a massive green monument that’s as much a part of the city as Sam Adams and Cheers. The ride from Admiral’s Hill into Charlestown is a fun one on windy days when gusts across the Mystic River lift your car a little bit as you reach the high point of the bridge, just before you descend 100 feet into a tunnel under Charlestown. 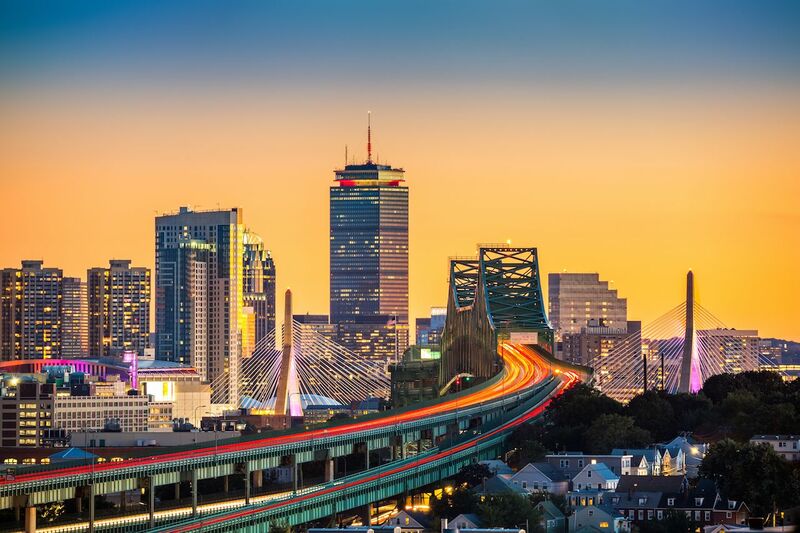 On calmer days, it’s a scenic way to drive into the city, with views of the river and the skyline serving as a perfect welcome to Beantown. Some fun recent headlines about the Mackinac Bridge: “Whiteout conditions, high winds force Mackinac Bridge to close.” “Ice falling from Mackinac Bridge smashes through truck’s windshield.” What we’re saying is, while this five-mile bridge across the Straits of Mackinac is a beautiful way to experience Michigan, definitely save it for summer. 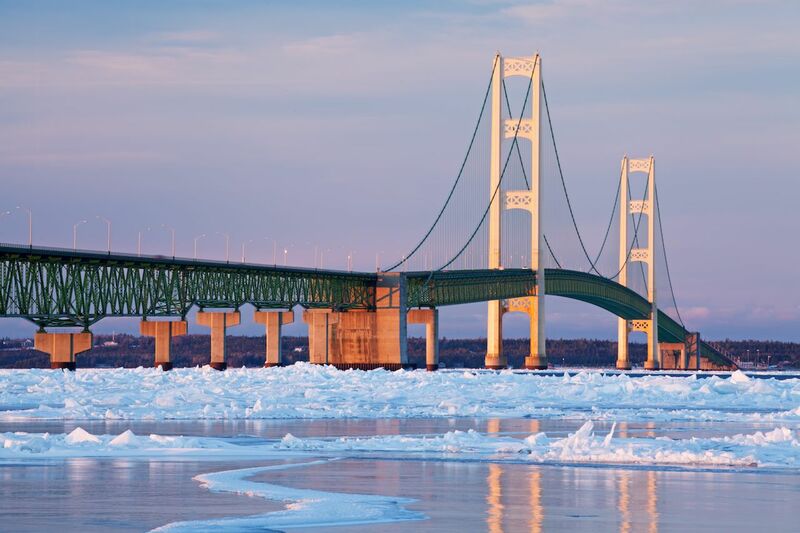 It’s the main connector between the mitten and the Upper Peninsula, pronounced just like Mackinaw but spelled differently because Michigan likes being difficult. The world’s 20th-longest main span is also the longest suspension bridge between anchorages in the western hemisphere. And every Labor Day it hosts the annual Mackinac Bridge Walk, where up to 80,000 people cross “Big Mac” on foot to mark the end of summer. The colorful arch you see in nighttime scenes of Minneapolis is the Lowry Avenue Bridge, a steel tied-arch bridge across the Mississippi River near Marshall Terrace Park. Though it’s barely six years old it’s already become a civic beacon, lighting up in rainbows for Pride; pink for breast cancer awareness; red, white, and blue for Fourth of July; and other festive colors. Its arch frames the city’s skyline perfectly if viewed from the right angle, making for one of the best urban photo-ops in America. Once upon a time, crossing this section of US-80 on the Mississippi–Louisiana border was a dicey proposition, as train tracks and auto traffic shared the same space atop the bridge. With nine-foot-wide lanes, trucks often reported having their side mirrors knocked off by oncoming trains, a pretty terrifying journey if only for a couple of miles. The bridge was closed to cars in 1998 and now sees about a dozen trains a day. It’s also open once a year to pedestrians during the annual five-mile Over the River Run in October. The Eads bridge was a pioneer in engineering, the first steel truss bridge in the world built to usher in the industrial era and westward expansion in 1874. It took seven years to build at a cost of nearly $10 million, the first bridge to ever have railroad tracks and the first with piers dropping down 123 feet. It’s still beautiful in its historic charm, crossing the Mississippi in two arches between old granite piers. 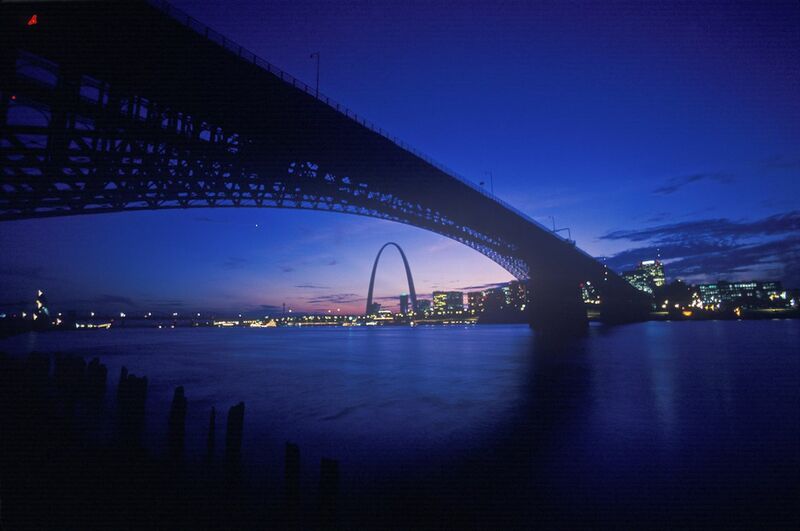 It connects St. Louis with East St. Louis in Illinois and was dedicated a National Historic Landmark in 1964. If you’ve ever gone fly fishing in Montana’s legendary Missouri River Valley, you’re probably familiar with Norman Maclean’s A River Runs Through It, much of which is set around Wolf Creek. The bridge is a local landmark, a simple two-pier structure that runs 500 feet over the Missouri. 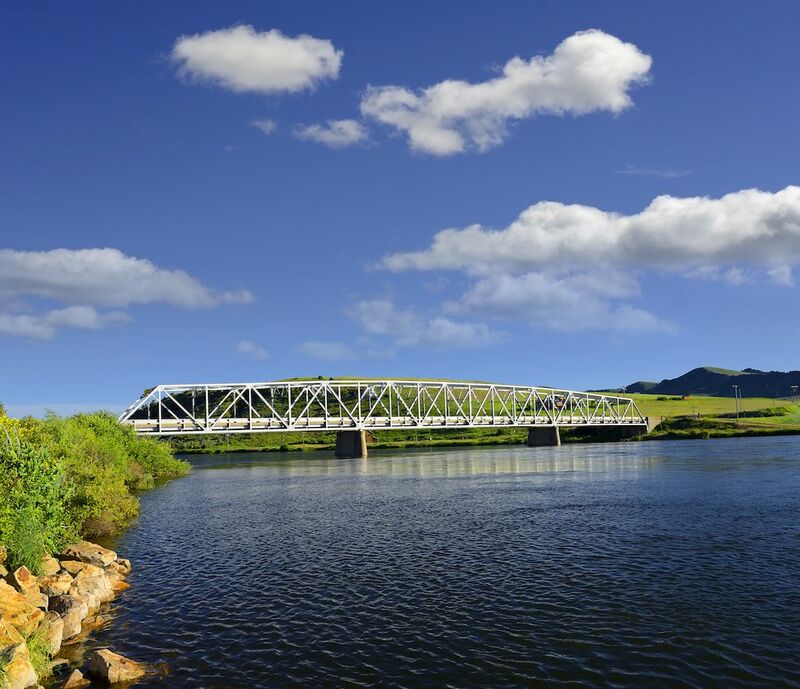 When skies are clear — which is most of the time in Big Sky Country — the bridge is a perfect pastoral scene of a calm river with towering mountains behind it. And in the summer it makes for a perfect setting for a fly-fishing vacation. Omaha has a highly underappreciated skyline, accentuated by this cable-stayed bridge. It connects Omaha with Council Bluffs, Iowa, across the Missouri River, and when lit up at night it serves as the perfect frame for the modest collection of high-rises behind. The Bob, as it’s called locally, connects to over 150 miles of trails, making it a popular starting point for long weekend bike rides and riverfront runs. Or if you’re more in the mood to relax by the bridge, it also connects to Omaha Plaza with a fountain and summer music series. Until 2010, crossing the Hoover Dam from Arizona into Nevada meant literally driving atop rickety US-93 across the dam. Which could get downright tortuous during tourist season. 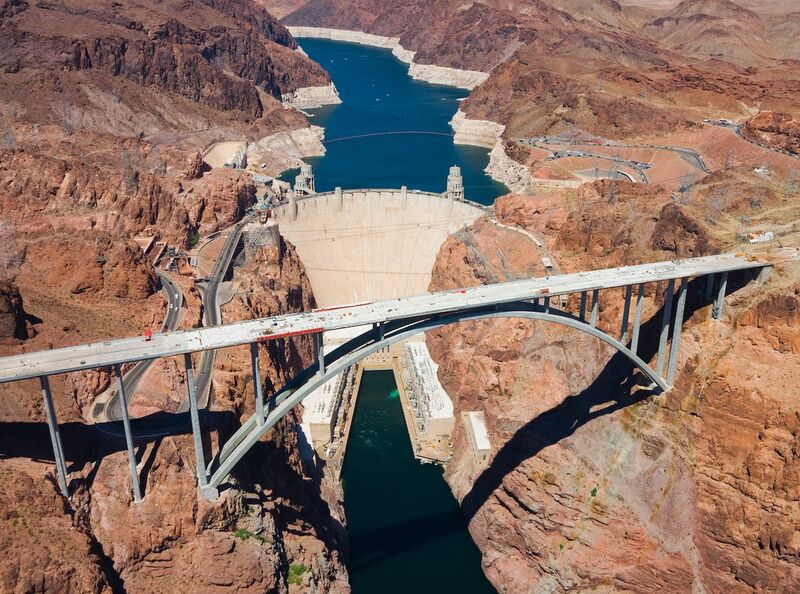 But in 2010 this twin-rib, concrete arch bridge opened 890 above the Colorado River, allowing drivers to bypass the dam altogether with a stellar view to boot. The bridge is the largest of its kind in North America, spanning 1,900 feet across the vast desert gorge. It is named after former Nevada governor and NFL star Pat Tillman who was killed while serving in Afghanistan. New Hampshire’s covered bridges are some of its biggest attractions, but the longest wooden bridge in the United States is far and away king among them. In addition to being on the National Register of Historic Places, this bridge spanning the Connecticut River between Cornish and Windsor, Vermont, is also the longest two-span, covered bridge in the world. 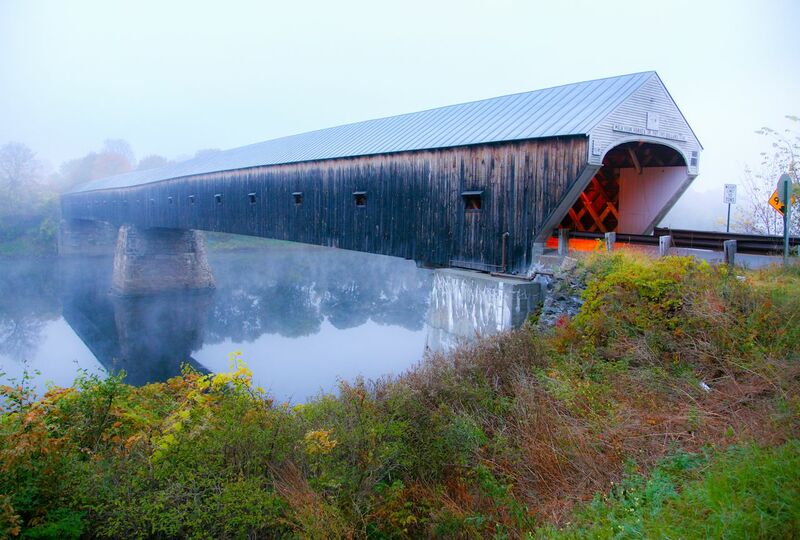 At 460 feet, it’s also the longest covered bridge in America and a classic example of the timber truss design that was popular in early New England. Ok, there’s nothing pretty about this bridge, especially compared to some of the beach bridges on the Jersey Shore or pedestrian bridges near Pennsylvania. 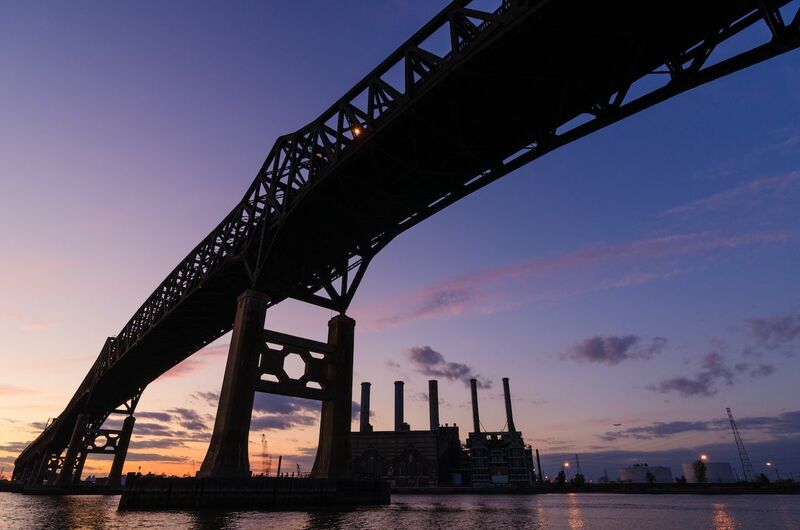 But perhaps the Pulaski Skyway, which connects Jersey City with Newark, is the most photographed bridge in Jersey thanks to commuters shedding tears of joy when it finally reopened last June after four long years of construction. The bridge, built in 1932, carries 74,000 cars a day, all of which had to find other routes for the middle part of this decade. Before that, it was featured in the opening credits for The Sopranos, running 3.5 miles over the Passaic and Hackensack Rivers. 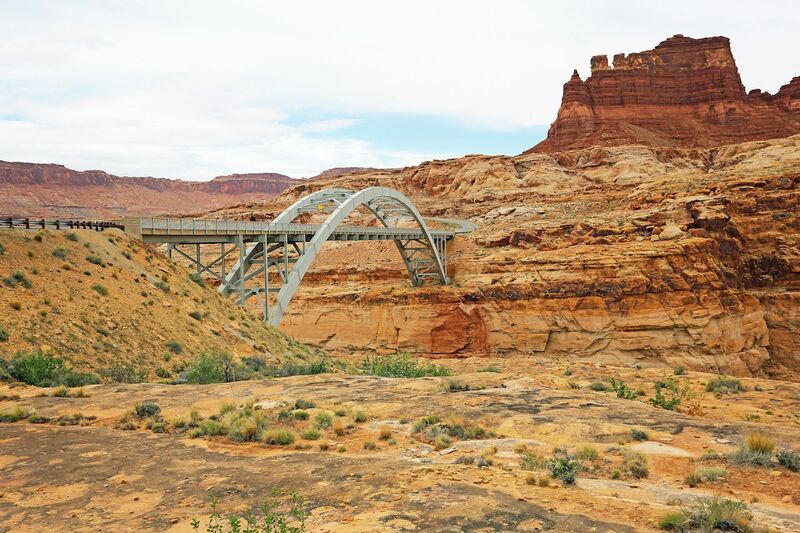 A stunning piece of classic southwestern scenery, the fifth-highest bridge in the United States spans stunning red rocks with snow-capped peaks in the background and a rushing river below. It also features a number of viewing platforms jutting out from the main roadway, giving the feeling of standing right on the edge of the 585-foot drop. If you’re afraid of heights, maybe just pull into one of the visitors centers and enjoy the view from there. 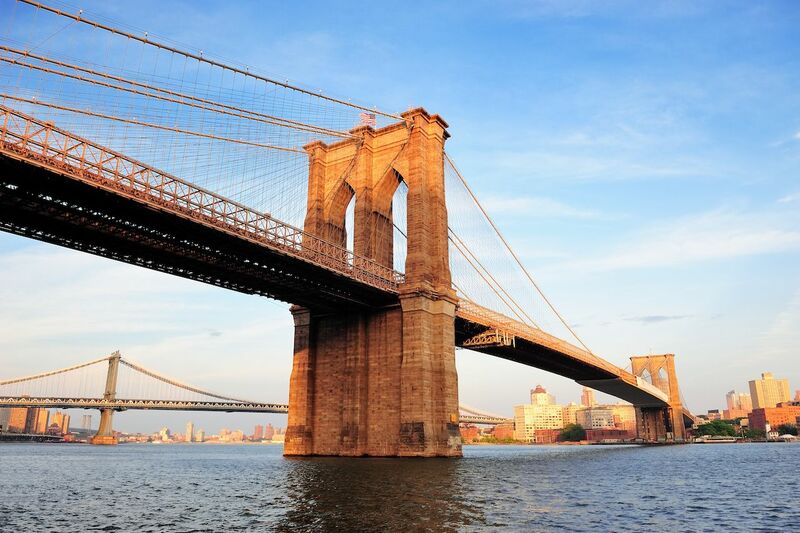 No huge surprise that the most-photographed bridge in America is also the prettiest in the state, as much a symbol of New York City as the Statue of Liberty and the Empire State Building. When it was completed in 1883, it was the first steel wire suspension bridge in the world and the longest bridge of any kind. Because everyone was afraid to cross something so massive, P.T. Barnum famously crossed the bridge with a troupe of elephants to quell public panic. Unfortunately for its designer, the legendary John Augustus Roebling, he never got to see his vision come to fruition; he was injured while measuring the East River for construction and became sick, leaving his wife Emily to secretly take over much of the chief engineering duties. He later died from Tetanus resulting from the injury; Emily saw through the completion of the bridge and was the first to cross it in a carriage. 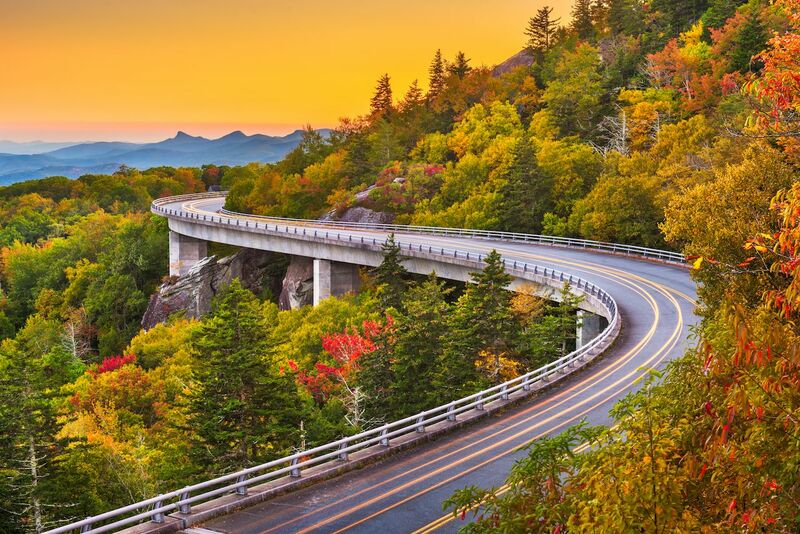 The Blue Ridge Parkway is another classic American drive, especially in the fall when the mountains are lit up in reds, oranges, and yellows. The final section of the road was this 1,243-foot viaduct that took 20 years to complete as landowners, engineers, and environmental advocates battled over how to construct it while preserving the area. The bridge’s construction was challenging as builders were not allowed to use heavy equipment on the ground. Rather each eight-foot segment was placed by a custom-made crane, which traveled along the road as it was being built. The story of the Fairview Lift Bridge is a little sad, about a grand project that never got to realize its full potential. 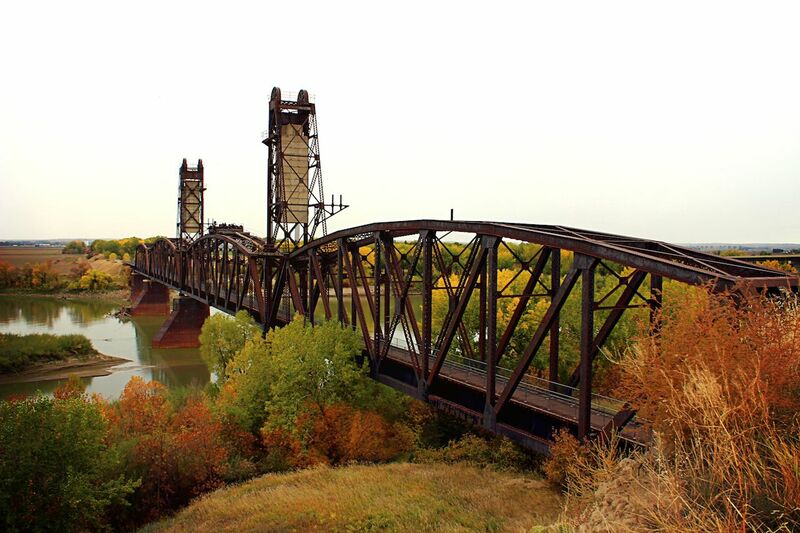 The bridge was designed to accommodate steamboats along the Yellowstone River. But the steamships stopped running before the bridge was completed. So the lift, which still has its giant concrete counterweights hanging in the middle of bridge, was only used once. It closed to cars in 1955 and to trains in the 1980s. But for its construction and disappointing story, it was placed on the National Register of Historic Places in 1997. Some people, when visiting Cincinnati, remark that this bridge over the Ohio River looks remarkably like the Brooklyn Bridge. They should, however, say the Brooklyn Bridge looks a lot like this one, as John A. Roebling designed it decades earlier. The bridge took 11 years to build, interrupted by the Civil War and vast economic difficulties, finally opening in 1867. It is still in use today, a popular commuter route from Cincy into its Northern Kentucky suburbs. The Skydance Bridge is the only one on this list that doesn’t go over a drop of water — and also the only one that’s equal parts sculpture and bridge. 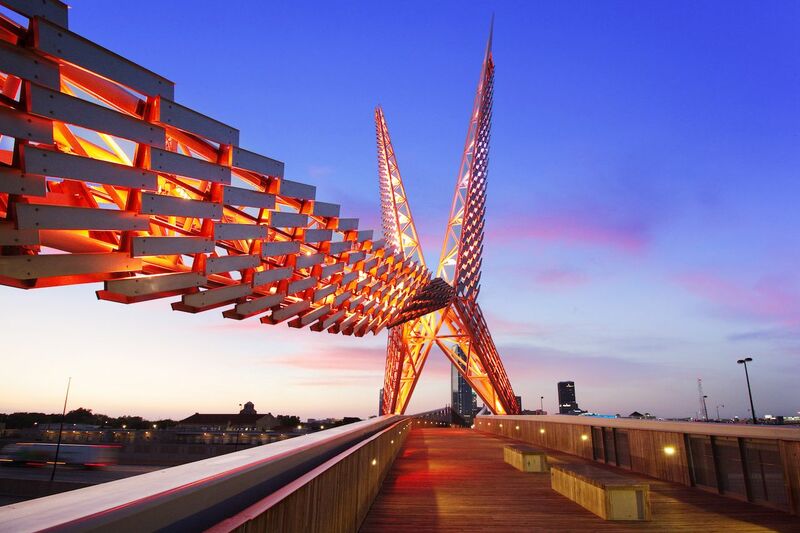 This tribute to Oklahoma’s state bird, the scissor-tailed flycatcher, boasts a 197-foot sculpture of the bird on one end, which lights up different colors. 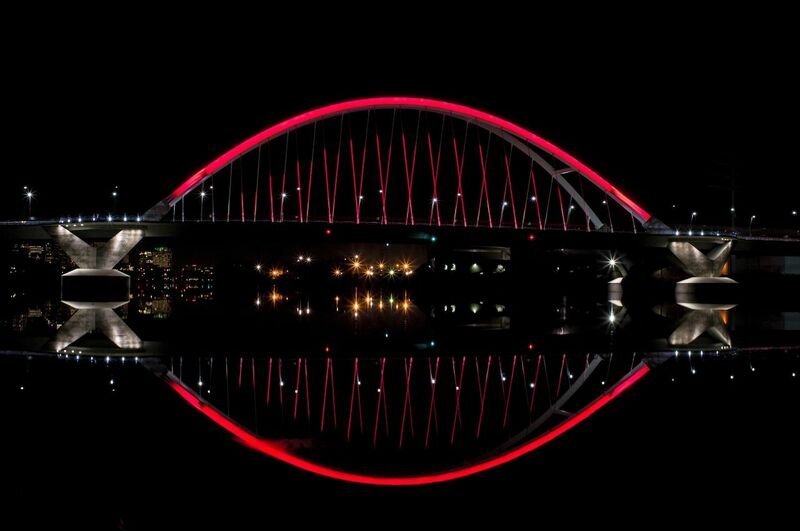 The pedestrian bridge spans 381 feet across I-40 and has become a symbol of the OKC skyline. 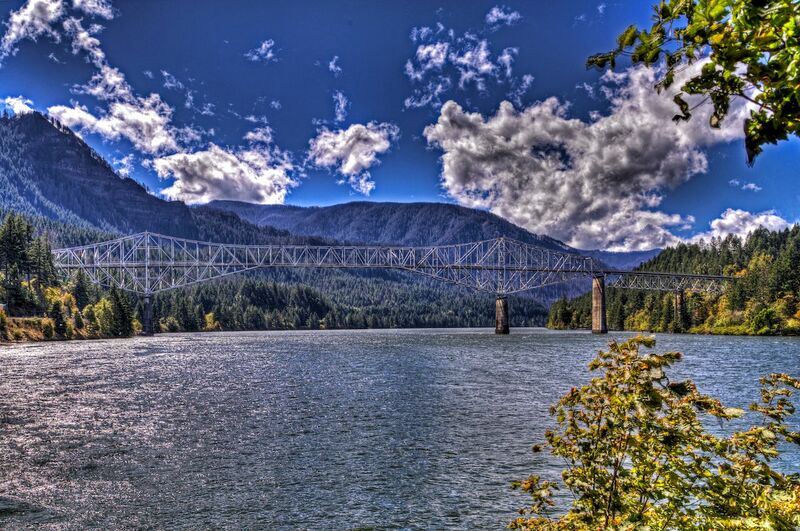 The longest steel truss bridge in the United States runs across the Columbia River from Astoria to Megler, Washington. The 4.1 miles of bridge were the last section of US-101, which when completed in 1966 created a scenic highway from Olympia, Washington, to Los Angeles. Because it connected such important stretches of highway it carried nearly a quarter million vehicles in its first five months and now sees 1.6 million cars annually. 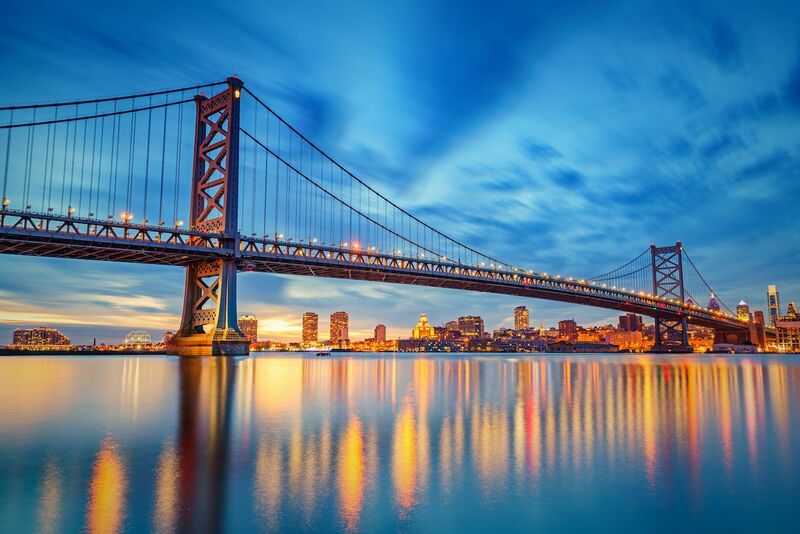 The blue towers of the Ben Franklin Bridge are a fixture of the Philadelphia skyline, used in exterior shots in hundreds of movies and TV shows to establish setting in the City of Brotherly Love. 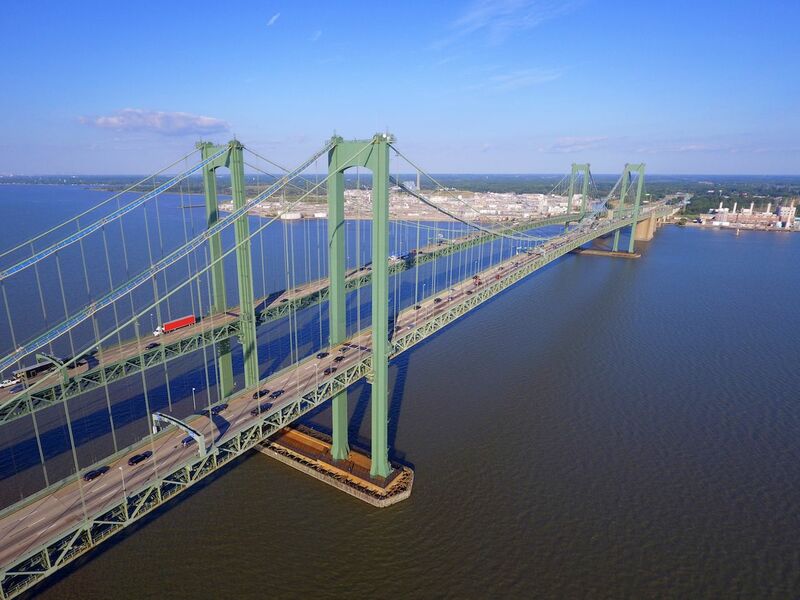 It runs from Philadelphia to Camden, New Jersey, carrying 37.1 million vehicles across the Delaware River last year. The best way to experience it, though, is on the pedestrian walkway where you can stop and take all the Philly skyline selfies you want without risking the ire of famously friendly Philly drivers. You’d be hard pressed to recognize a picture of this bridge without a few dozen sailboats sitting in front of it, as it’s almost always photographed with sails in the foreground. 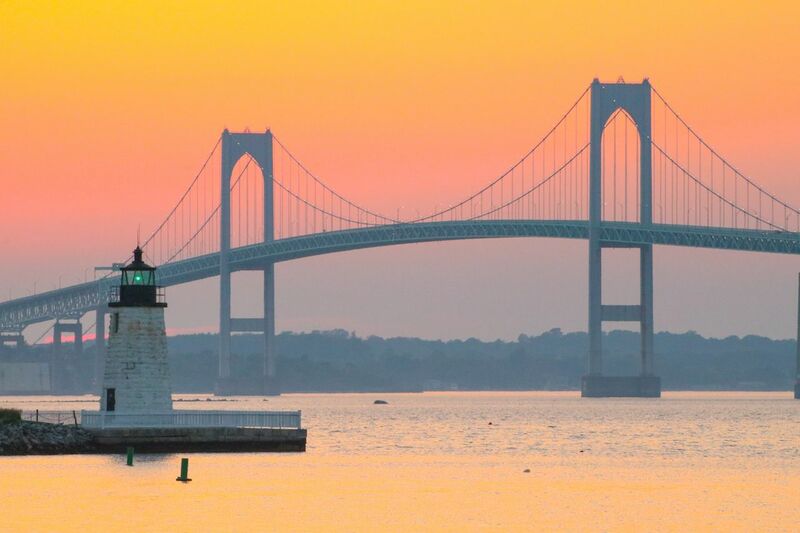 In the almost 50 years it’s been open, the Newport Bridge, as most call it, has become a symbol of the state, stretching 3.4 miles across Narragansett Bay with towers rising 400 feet above the water. The bridge sees about 27,000 vehicles a day, and you can find an image of it on the back of Rhode Island’s quarter. South Carolina is known for a great many things — food, history, beaches. Tall buildings not so much. So it should come as no surprise the tallest structure in the state is this bridge, whose cable-stayed towers stand 573 feet over the Cooper River. 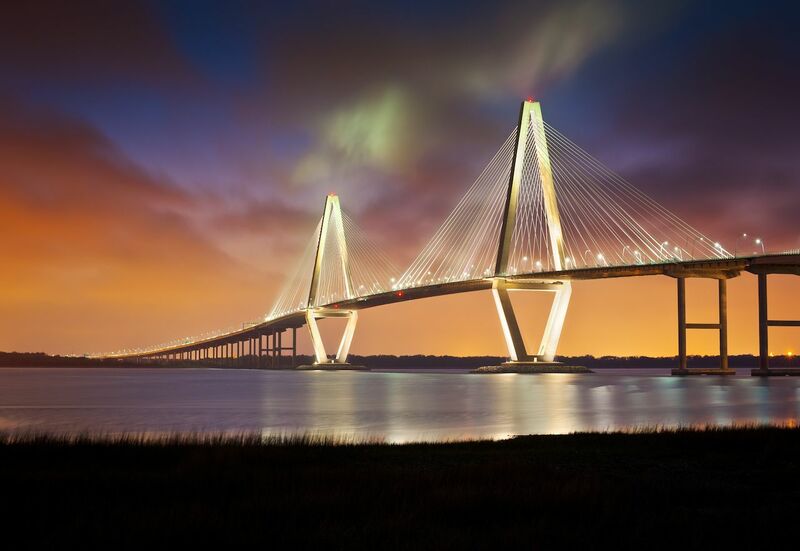 It was also the largest cable-stayed bridge in North America when it opened in 2005, connecting Charleston with Mt. Pleasant and replacing the old Grece Memorial and Pearman bridges. 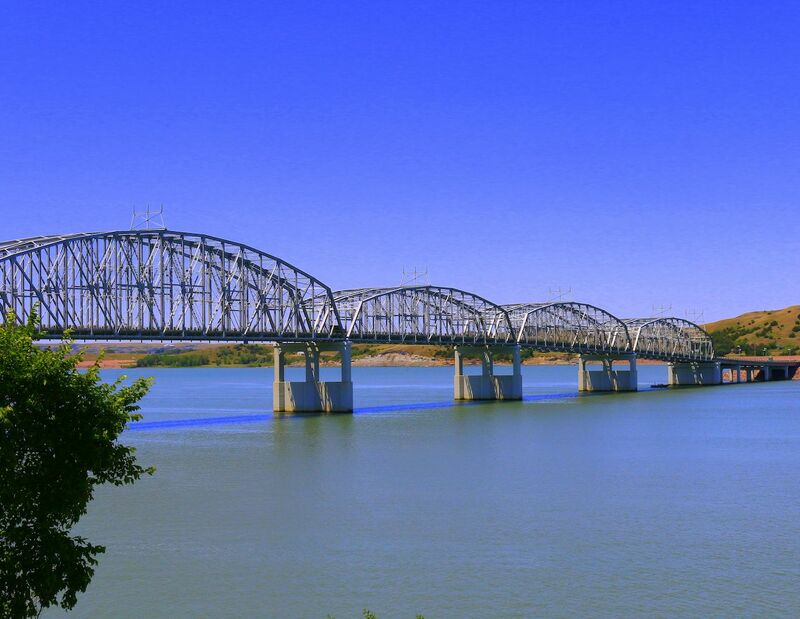 The original Chamberlain Bridge was constructed in 1925, part of a series of five nearly identical bridges the state commissioned to cross the Missouri River. But as trucks became more prevalent along the road and the Fort Randall Dam changed the makeup of the river, this new bridge was constructed by combining trusses from some of the old bridges,. You can still see some of the pilings from the old bridge as you speed across, which most do in a state where speed limits are loosely interpreted. Still, if you’re going to take time to slow down during a drive across South Dakota, this is the place to do it. Anyone who’s been to Chattanooga would assume the city along a big bend in the Tennessee River was home to the prettiest bridge in the state. 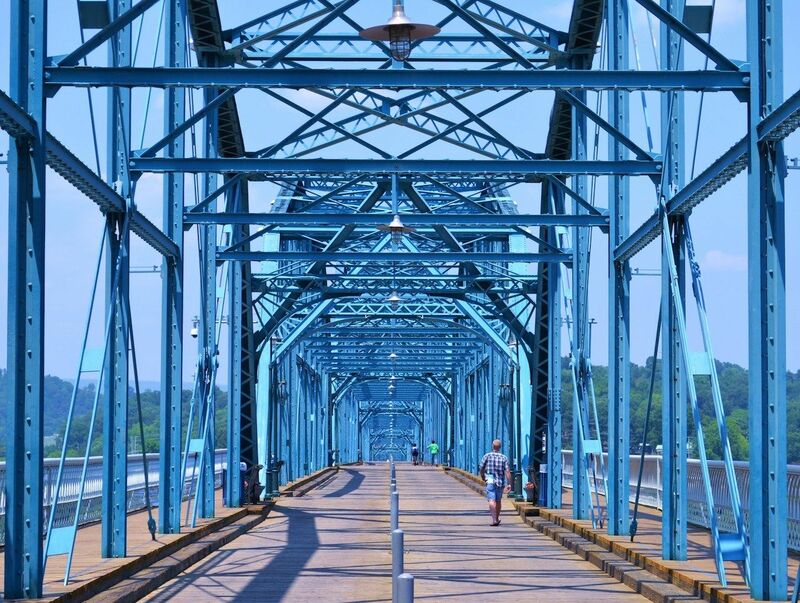 This 2,375 span connects Chattanooga to the North Shore and is one of the longest pedestrian bridges in the world. It was closed to vehicle traffic in 1978, and though placed on the National Register of Historic Places in 1990, it didn’t see major repairs until the early part of this decade. It’s now one of the most popular recreational trails in the city and hosts the annual Wine Over Water event in October. 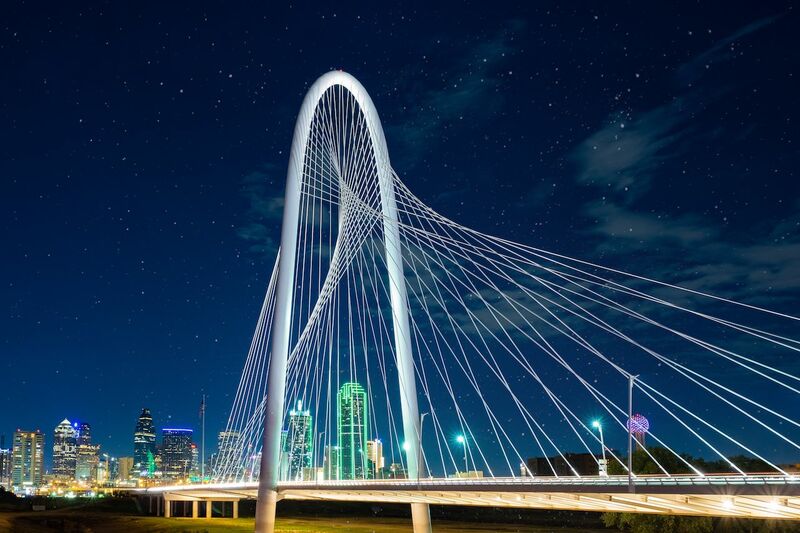 Dallas’s bridge across the Trinity River has become as much a part of its skyline as the ball atop the Reunion Tower, an unmistakable sight welcoming drivers to Big D. The 1,870-foot bridge opened in 2012 after nearly seven years of construction at an estimated cost of over $180 million. But such is the cost of building a landmark, as the signature arch supporting the steel cables lights up after dark, giving the skyline a different character every night. Before the construction of the Glen Canyon Dam, the area around Cataract Canyon was a popular ferrying and fording spot for early settlers across the Colorado River. 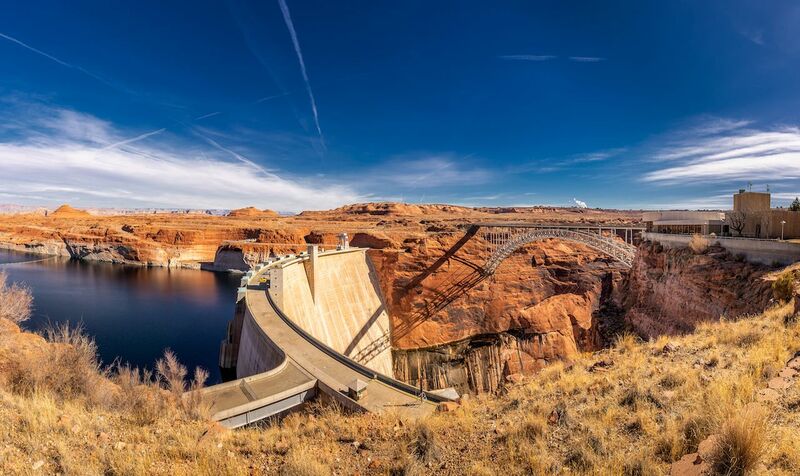 Once the dam was built and the water of Lake Powell rose, a newer, higher bridge was needed. Enter Hite Crossing, a 735-foot arch bridge that takes State Route 95 over the river. It stands 200 feet above the water’s surface, and although stopping isn’t advised, the view from the middle is one of the most scenic in the state. 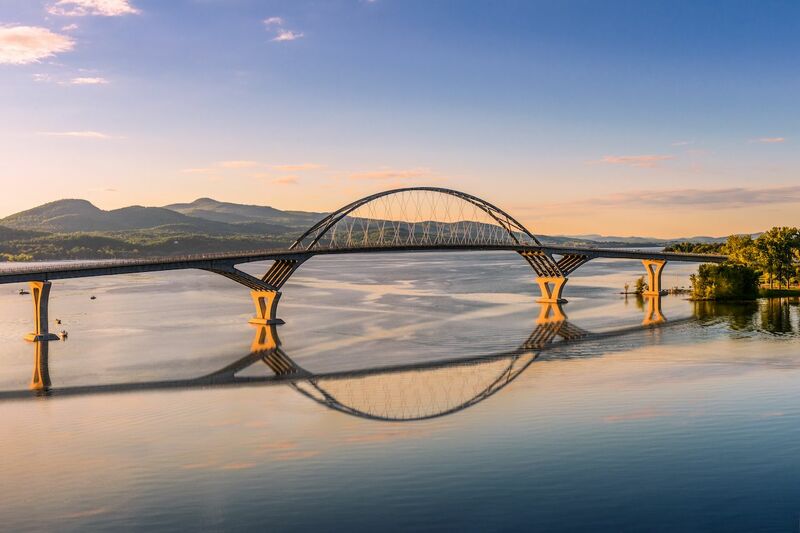 In possibly the most efficient feat of government work this decade, the replacement for the dilapidated old Champlain bridge between New York and Vermont was completed in only two years. The cooperative venture between the two states came in only $9 million over budget at about $78 million and would have been completed sooner if not for record flooding in the area. The most interesting aspect of its construction was the trademark center arch, which was actually built offsite in Port Henry, New York, then transported along the lake by barge and lifted into place. Having a bridge to connect the end of the Delmarva Peninsula to southern Virginia seems sensible, but the amount of ship traffic through the mouth of the Chesapeake Bay makes it pretty impractical. The solution was putting part of that bridge underwater, which is what you’ll find in the middle of this 23-mile section of US-13. 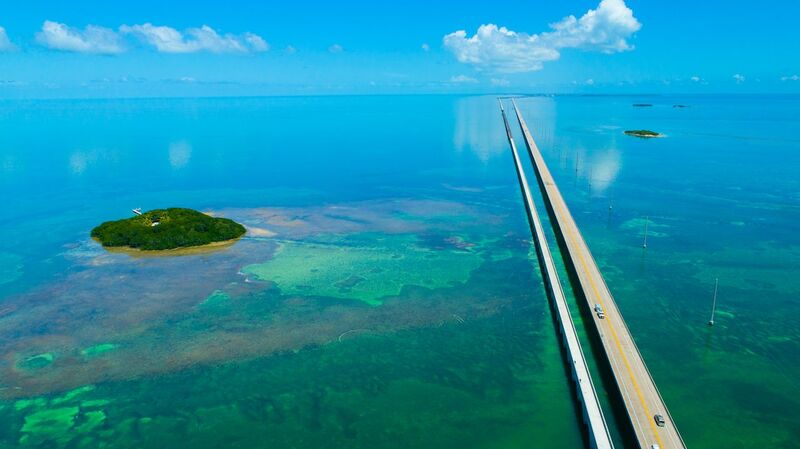 For about a mile, the bridge dips underwater into tunnels held in place by man-made islands. Drivers then emerge on the other side and continue along the bridge. 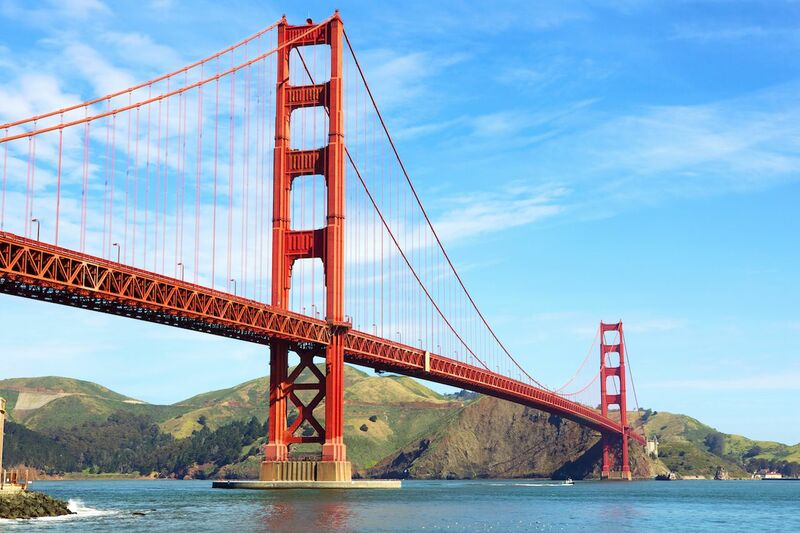 It’s a pretty genius construction that led the American Society of Civil Engineers to name it one of the seven engineering wonders of the modern world when it opened in 1964. Given the sheer number of bridges in the world, this seems like a pretty bold name to give a cantilever truss bridge that’s not even 2,000 feet long. Granted, the setting across the Columbia River is pretty spectacular, but the name is actually a tribute to a centuries-old land bridge that once crossed near the same spot, the result of Bonneville Landslide. The Native Americans in the area gave that bridge its name, and when this one was constructed in the 1920s, it received the same name. You’ll find a little slice of the Rocky Mountains in the adventure town of Fayetteville, which sits right outside this landmark that’s the fourth-largest single-span arch bridge in the world. 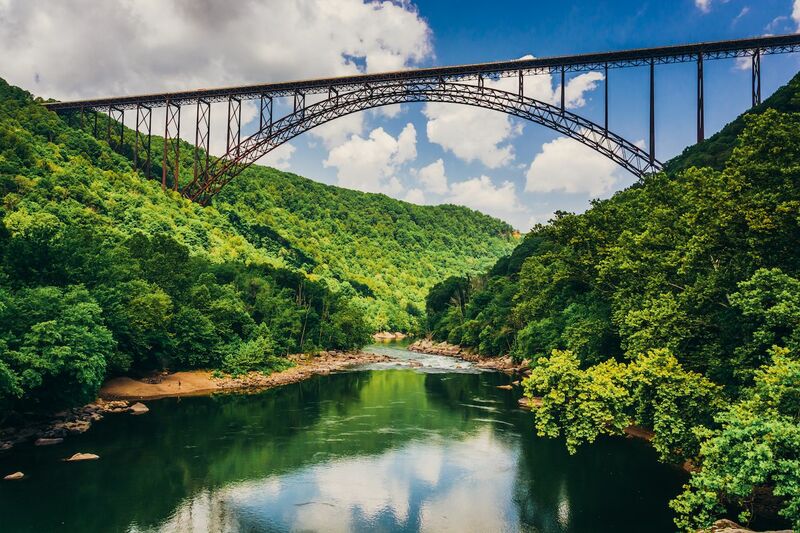 In addition to representing its state on the quarter, the New River Bridge also hosts the annual Bridge Day when hundreds of people rappel, bungee jump, BASE jump, and find other ways to plunge from a perfectly fine bridge down towards the rushing New River. The event draws tens of thousands to the area for a daylong celebration that many say is the state’s annual highlight. The Hoan Bridge might be the only bridge in America best recognized as a construction site. As political problems delayed its construction during the 1970s, location scouts for the Blues Brothers movie found it the perfect spot to film the movie’s famous car chase between the brothers and a gang of crazed Nazis. It’s still probably the most notable structure in the city, used in exterior shots from Summerfest and even in a Will Ferrell Old Milwaukee commercial. 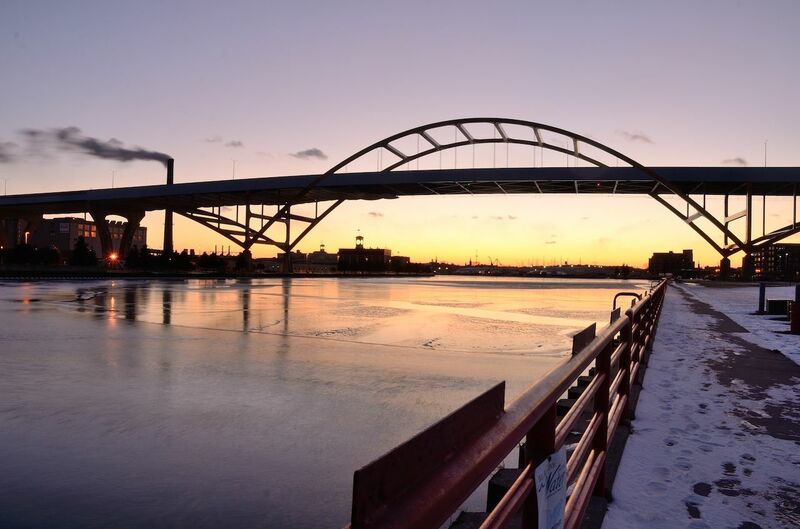 The Hoan Bridge also provides a perfect welcome to the city when driving north into downtown, where the small skyline comes into view just as you reach the top. Only three natural rock bridges in America cross over water, and this one about a mile south of the Oregon Trail is the most beautiful of all. 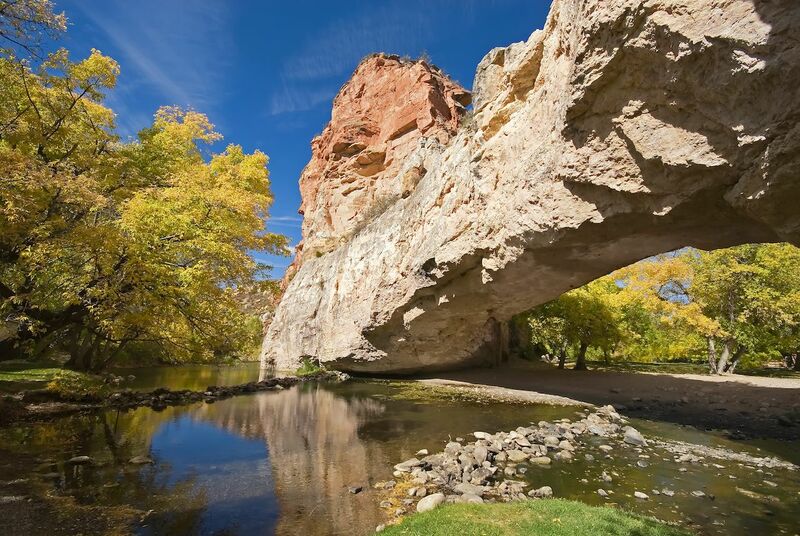 Once upon a time, the cool waters and shady trees near the bridge served as a respite for pioneers making the long trek west. Now it’s a popular place for summertime recreation, with volleyball courts, horseshoe pits, hiking trails, and LaPrele Creek to splash around in. Just don’t try and go during the winter; the bridge is only open from April to October, though some intrepid photographers have found it looks fantastic in the snow.